Superstar Rajinikanth who took a short trip to US along with his daughter Aishwarya is back in town. The Star was seen in action celebrating the Festival of Lights with his family. 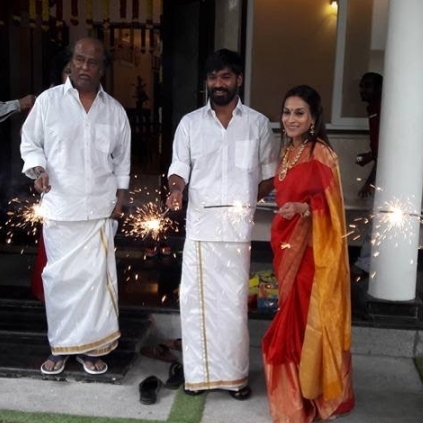 His daughter Aishwarya, son-in-law Dhanush, Soundarya with her son and Madhuvanthi Arun were all seen in traditional costumes enjoying the fervor of Diwali. Earlier in the day, he met his fans and interacted with them, giving them all a memorable Diwali. The Thalapathy hero was as simple and stylish as ever with a dhoti and white shirt with his son-in-law Dhanush also following suit. Now that the actor is back, he may be expected to join the sets of Shankar’s 2.0. We would keep you posted! Will Mammootty and Vijay's dad say yes? Kaashmora Day 1 box office collections!